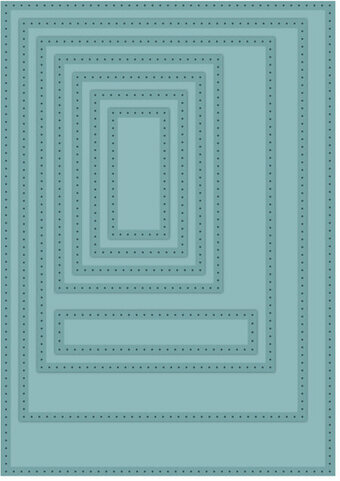 This is a stand alone die set that includes 8 rounded rectangles with an inner stitched border. The dies cut the shapes shown and work with many of the popular die cutting machines such as the Big Shot and the Cuttlebug. The rectangles measure: 4 x 5.25 inches, 3.5 x 4.75, 3 x 4.25, 2.5 x 3.75, 2 x 3.25, 1.5 x 2.75, 1 x 2.25, 0.5 x 1.75. Set of 4 dies. You can use these in so many ways. Due to the stitching on both the inside and outside of the dies (except for the largest square, which only has stitching on the inside), you get 2 cuts in one. Use for layering, and for card apertures. You can also stack 2 sizes together for great shaker card frames. The dies measure: 3.75"x3.75", 3"x3", 2.25"x2.25", and 1.5"x1.5"
This lovely frame will add a beautiful decorative touch to your projects. Change up the look by using it with or without the poppies. Craft Dies by Sue Wilson are part of an elegant collection of high quality steel dies designed to coordinate with each other. Includes 4 dies. 3.9" x 5.3". 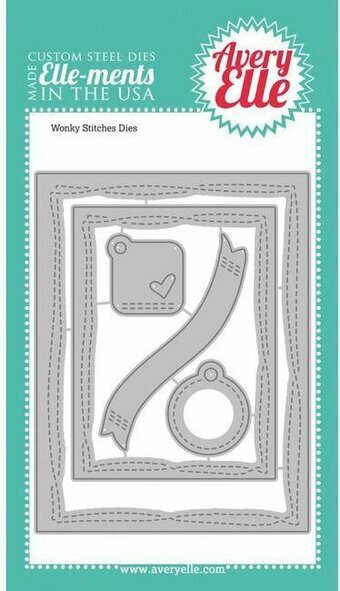 Our Wonky Stitches Elle-ments steel dies create a whimsical stitched pattern in a variety of mat sizes, banner and tag shapes. 5 attached dies. Outer rectangle die measures: 4" x 5 1/4" ; Inner rectangle die measures: 3" x 4" ; Banner measures 3 1/2" x 7/8" ; Square tag measures 1 1/8" x 1 1/8" ; Circle tag measures: 1 1/4" x 1 3/8" . Our Exclusive Steel Dies are proudly made in the USA.